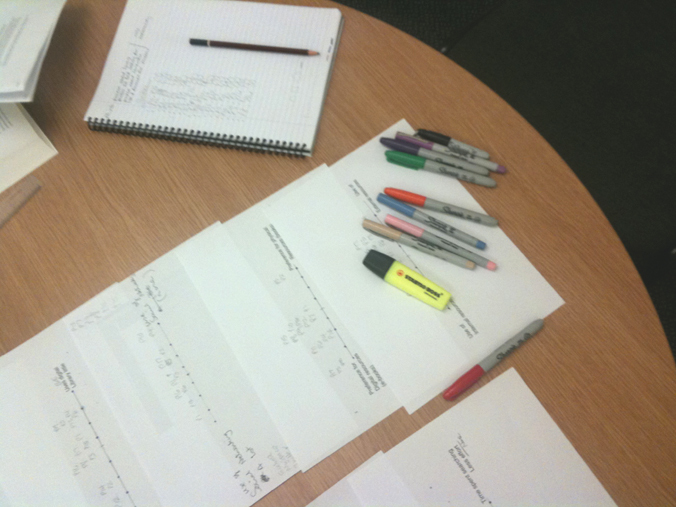 In Lorraine’s last blog she described the data gathering methods used to obtain representative data from users of Edinburgh University’s Library services, the purpose of which was to identify patterns in user behaviours, expectations and motivations to form the basis of our personas. Raw data can be difficult to process and it is impossible to jump from raw notes to finished persona in one step, hence our six step guide. There is no one right way to create personas and it depends on a lot of things, including how much effort and budget you can afford to invest. There are lots of articles on the web detailing various approaches and after much reading we decided to rely on 2 main sources of information which we felt best suited our needs. One resource was the Fluid Project Wiki which is an open, collaborative project to improve the user experience of community source software and provides lots of useful guidance as well as sample personas. The other resource which we heavily relied on throughout the whole process was Steve Mulder’s book The User Is Always Right: A Practical Guide to Creating and Using Personas for the Web, which contains lots of great advice as well as step-by-step coverage on user segmentation. There are a number of important steps to go through in order to get from raw data to personas and I will now explain the tools and methods used to generate our segments and personas for anyone who wishes to follow in our footsteps. We spent a day reviewing our notes in the wiki and fleshing out goals by referring to written notes taking during each interview, checking the audio recordings where necessary. We worked as a team which was beneficial as we were both present for each interview and therefore had a good grasp of all the data in front of us. Once we were happy with our set of notes, we printed out participant’s interview notes and attached each to the white board to make it easier to review all data grouped together. Next step was to summarise each of our 17 participants (try to figure out who are these people) based on the following 4 categories. We used different coloured post-it notes to denote each of the above categories. Once we had gone through this process for each participant, our whiteboard was transformed into a colourful mirage of notes. We were now ready to start a two-by-two comparison of participants. The next step utilised the two-by-two comparison method, a technique advocated by Jared Spool at User Interface Engineering (UIE.com). This works by reading 2 randomly chosen participant summaries and listing attributes that make the participants similar and different. We then replaced one of the summaries with another randomly chosen one and repeated the process until all summaries were read. We then created a scale for each distinction identified during the two-by-two comparison and determined end points. Doing so allowed us to place each participant on the scale and directly compare them. Most variables can be represented as ranges with two ends. It doesn’t matter whether a participant is a 7 or 7.5 on the scale; but what matters is where they appear relative to other participants. 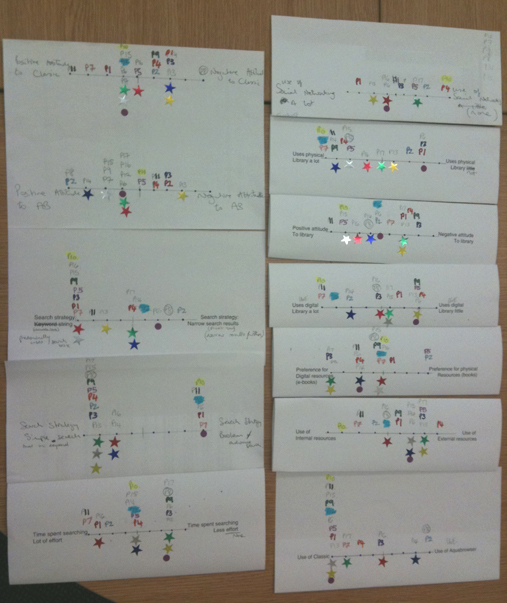 The image below provides an example of our 12 scales mapped for each of our 17 participants. Now that we had all our participants on the scales, we then colour coded each individual to make it easier to identify groupings of participants on each of the scales. We looked for participants who were grouped closely together across multiple variables. Once we found a set of participants clustering across six or eight variables, we saw this as a major behaviour pattern which formed the basis of a persona. After quite a bit of analysis, we identified 6 major groupings, each identifying an archetype / persona, which we gave a brief description to on paper, outlining the characteristics and identifying their unique attributes. After reviewing each description we realised that group 6 was very similar to group 4 and so merged these two sets together, leaving 5 groups at the end of this step. We were now ready to write up our 5 personas. For each group we added details around the behavioural traits based on the data we had gathered, describing their goals, information seeking behaviours and system usage amongst other things. We also talked about frustrations and pain points as well as listing some personal traits to make them feel more human. We gave each persona a name and a photo which we felt best suited their narrative. We tried to add parts of participant’s personalities without going overboard as this would make the persona less credible. 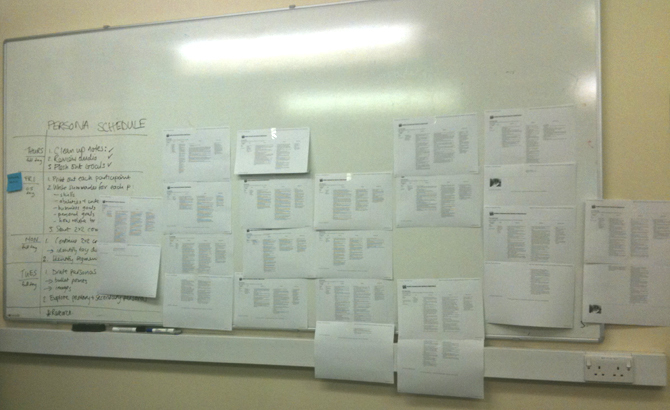 We kept the detail to one page and based it on a template provided by the Fluid Project wiki. It’s important to keep persona details to one page so they can be referred to quickly during any discussions. Remember that every aspect of the description must be tied back to real data, or else it’s shouldn’t be included in the persona. Research has shown that a large set of personas can be problematic as the personas all tend to blur together. Ideally, you should have only the minimum number of personas required to illustrate key goals and behaviour patterns, which is what we ended up with. Finally, to ensure we had a polished product, we asked a colleague who was not involved in the persona creation, to review the personas for accuracy in spelling and grammar. From my experience, I would say that the most difficult step of the process was getting from step 3 (Two by Two comparison) to step 4 (Identify segments). 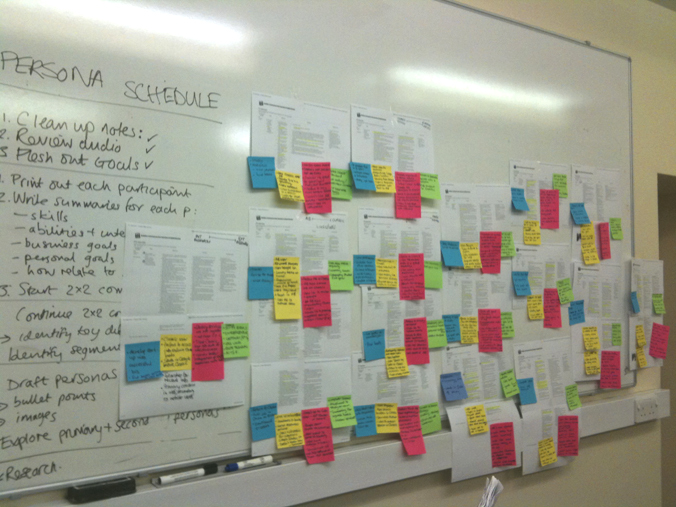 Although we had initially planned to spend 3 days creating our personas, in the end it took us 5+ days. 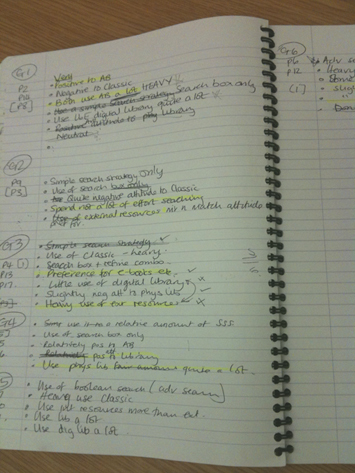 If we were to repeat this exercise, I would allocate adequate time directly after each individual interview to write up detailed notes on the interviewee, detailing their specific goals, behaviours, attitudes and information seeking behaviour, rather than waiting until a later date to review all the notes together, as described in Step 2. In saying this, there are various different approaches which can be taken when creating personas and we would be very interested to learn what other researchers might do with the same data. In the concluding part of this blog series, “User Research and Persona Creation Part 3: Introducing the personas”, Lorraine will discuss how we plan to keep the personas relevant and current in the future.